Last summer, I made a new friend. She and her husband and young son have just adopted a beautiful baby from China, and now that she’s here, the girl obviously needs a handknit and SOON. In China, red is the color of happiness, good luck, and/or prosperity (at least, that’s what my Google search tells me). I immediately went to my yarn archives in search of the proper red with which to decorate this adorable, and adored, child. It was hard to find a red that was RED enough. Too itchy, too murky, too much made out of paper, too WRONG. Scheepjes Java: 42% cotton/38% acrylic/14% viscose/6% nylon/100% WACKY. Now THAT is some red yarn. Remember it, Kay? The yarn I bought when you were here in Nashville, when we were supposed to be fixing pattern directions but we decided it would be better for everyone if we went yarn shopping? The wrapped part is really cool. I loved the . . . novelty of it all. So I bought three balls despite your howls and left it to marinate in the stash. I’m cooking up a little seed stitch cardigan, knit in one piece from the bottom until I get to the armholes at which point I’ll worry about sleeves. It’ll have one button, a RED one I expect, unless it’s a GOLD one. Once I find the right dress to go with it, our new Nashvillian will be all covered up in happiness, good luck, and/or prosperity. I guess there really is a project for every yarn. Even a cotton/acrylic/viscose/nylon yarn. That’s rilly red. PS Here’s a little quiz–name the eight red yarns that weren’t red enough for the baby sweater, and you’ll get a little prize. 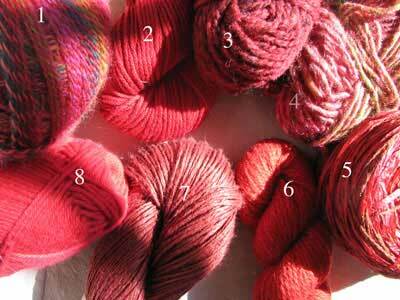 A hint: I have written about all these yarns except for #2 and #8. And Kay has written endlessly about those. Send your guesses to me via email. If more than one person gets them all right, we’ll have a drawing. Please send your entry before 11:48 pm, Central Standard Time, Thursday, March 9, 2006. PSS And talk about good luck– I discover from Emma that making this red sweater puts me in good shape for Project Spectrum, Lolly’s six-month exploration of color. March = Red Month! I can totally see the pull of that yarn. I’m still puzzling over some strange grapefruit colored yarn I saw in an LYS last year. The owner told me “people buy it to knit belts.” Well, not this people, but dang, those colors. Didn’t buy it, and it’s long gone, but that doesn’t stop me from still trying to figure out something to make with it. Some day I’ll figure it out and be crushed that I don’t have the yarn to act on. So I like the marinade approach! Oh Ann, how exciting! 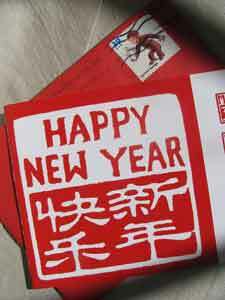 My Josie is from China–almost 10 years ago. 10 years ago today (in between bouts of worrying myself to death) I was working on the cutest little RED baby-sized chenille cardigan for her. I continued to work on it right up till the plane landed in Beijing, and then never picked it up again till she was way too big for it. You know how it is with babies… somehow there was never time to knit. I bet I still have it stashed somewhere, I’ll have to go look. Thanks for the sweet memory. I love that yarn! 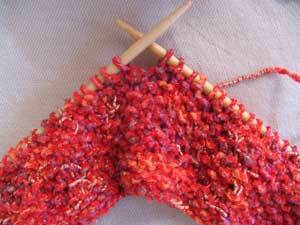 I would say that between the red and the gold it’s the perfect New Year New Baby Cardi Yarn. What is it again? Who made this substance? I guess it’s not surprising that I can i.d. all your yarns, but I wonder if I know you TOO well. Surely you have some yarn I don’t know about? My brother and his wife have recently adopted a baby girl from China and it has inspired in me a wild knitting frenzy. I have made 2 blankets and have a darling Miss Bea sweater on the needles for her now. Happy (red) knitting! Ack! You’re so right about Chinese and red connection! Unfortunately, I just bought a bunch of BRIGHT PINK yarn for a baby about to be adopoted from China…faux pas on me! Do I go with the pink, or buy more in red????? Red to a Chinese person is, as I’ve read (no pun, truly) “most auspicious color.” I hope we’ll see a picture of baby in her most auspicious color soon. such a “heart-y” color, ann…..loving all the nubs and slubs. it gives it character! How beautiful. The red and gold are perfect together! Red for traditional Japanese 60th birthday presents too. My mom (native Japanese) showed me a picture of my uncle, a 60-year-old Japanese man in a non-descript gray suit and a red beret, looking pleased as punch, my mom explained that it is a tradition to give a wearable red thing on 60th birthdays. So, it is always safe to buy red yarn, because someone will be turning 60 sooner or later. 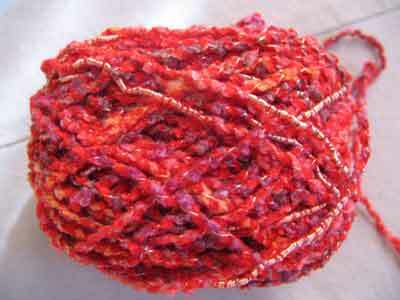 Schachenmayr Catania has a gorgeous flaming red that I can’t wait to be using soon! Wow! I think that it is absolutely perfect for what you are doing. I like to think of it as the fate or karma of our world. I have friends who adopted 2 little girls from China as well. The best part of their story is that she (my friend) was also adopted as a baby from China! When she (my friend) was brought here to meet her parents, she was just under 1 year old and wearing the most beautiful red silk with gold embroidery little baby kimono dress! Both of her daughters were brought here by her and her husband and they both wore the same dress. So all 3 of them step foot into their new lives and new country in the same glorious red and gold dress. I hope that your friends daughter brings as much joy into their lives as my friend and her daughters have brought into everyone whom they have touched. And I DO believe that that yarn was MEANT to be made into this little girl’s cardigan!